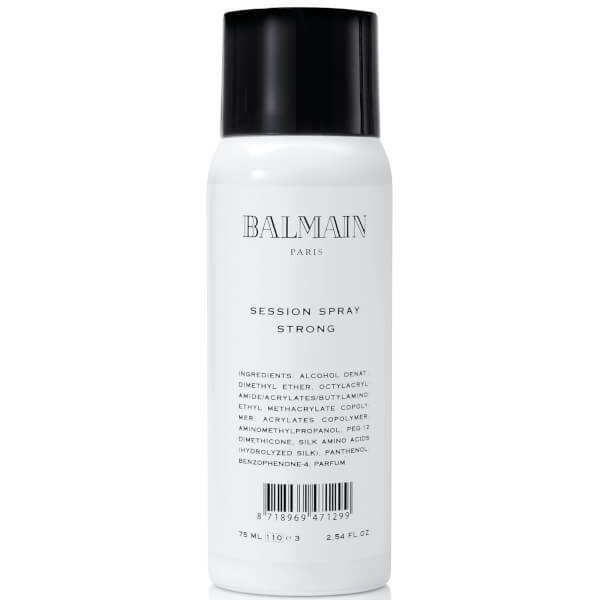 Set your style in place with Balmain Hair's Travel Size Session Strong Hair Spray; an ultra-fine, long-lasting formula that delivers firm hold without making hair heavy or stiff. Infused with Silk Protein and Argan Oil, the humidity resistant spray protects hair from UV rays and environmental aggressors, whilst nourishing dry, damaged strands from root to tip for a frizz-free, super smooth finish. Delivers instant shine and body for a salon-worthy finish. Spray from a distance of 15-20cm. Dimethyl Ether, Alcohol Denat., Octylacrylamide/Acrylates/ Butylaminoethyl Methacrylate Copolymer, Acrylates Copolymer, Silk Amino Acids, Aminomethyl Propanol, PEG-12 Dimethicone, Panthenol, Benzophenone-4, Parfum.